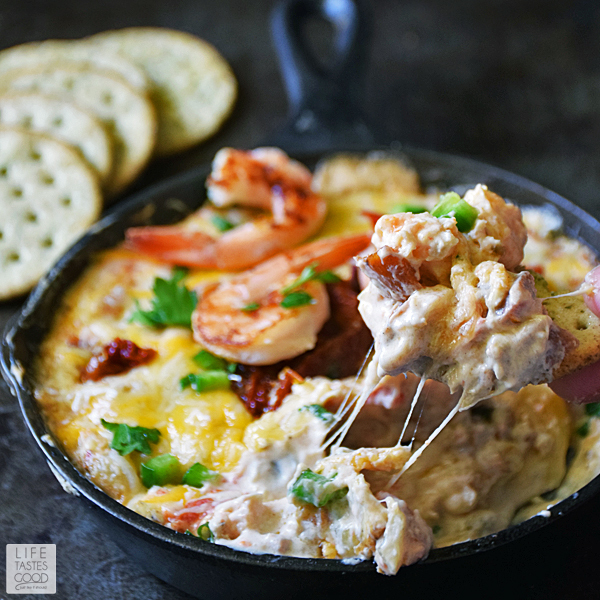 Skillet Jambalaya Dip is a twist on the classic Louisiana Creole Dish. Using many traditional ingredients, this Mardi Gras appetizer recipe tastes just like Jambalaya, but is quicker and easier to make. Jambalaya is traditionally a Louisiana rice and meat dish very similar to paella. This Spanish and French influenced dish is delicious any time, however, it is most famously known for being enjoyed during Mardi Gras each year. 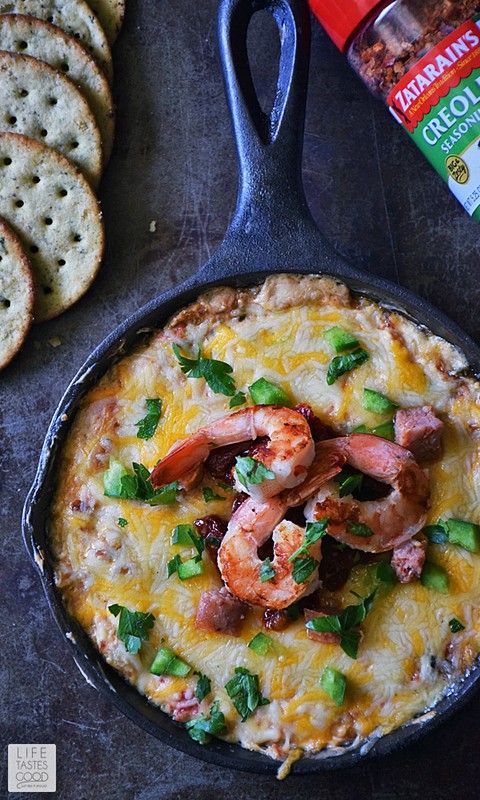 My Skillet Jambalaya Dip is the perfect appetizer recipe to celebrate Mardi Gras. Mardi Gras is a carnival held in some countries on Shrove Tuesday. It is a major holiday in New Orleans. People travel from far and wide to visit New Orleans during the celebrations leading up to Fat Tuesday. These celebrations typically include parades and family gatherings where Louisiana cuisine plays a major role. Shrove Tuesday is the day before Ash Wednesday, the first day of Lent. Shrove Tuesday is a carnival day that marks the last day of "fat eating" before the fasting period of Lent. We can't all travel to New Orleans to celebrate Mardi Gras, but we can enjoy a taste of New Orleans at home with Mardi Gras inspired recipes such as my Skillet Jambalaya Dip and Jambalaya Pizza, a super yummy pizza recipe that is perfect for your Mardi Gras staycation! You'll also want to check out my Easy Shrimp and Grits recipe for a stick to your ribs recipe you'll want to make all year long! So get festive, put on your Mardi Gras beads, and get cooking in the kitchen to create your own Mardi Gras feast! 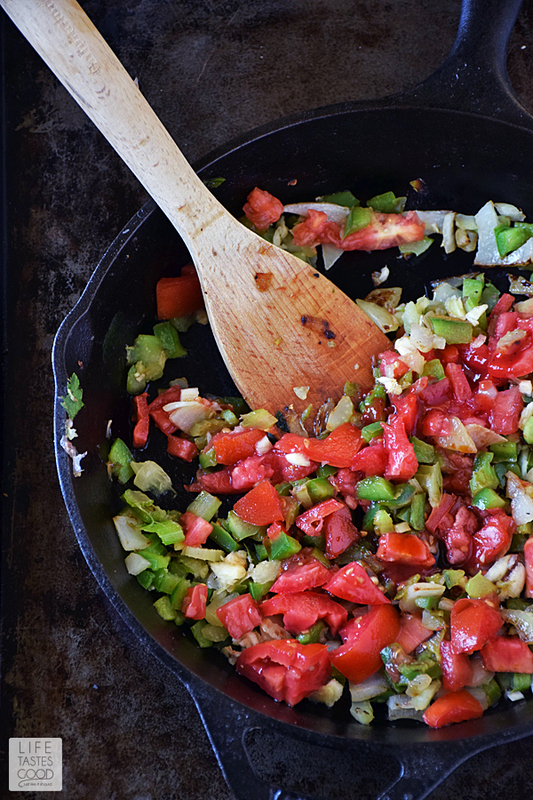 You'll only need about 15 minutes to make my Skillet Jambalaya Dip. This appetizer recipe will fill your home with the taste and aroma of Mardi Gras! Because this is a Mardi Gras appetizer recipe, I omitted the rice in my skillet dip recipe, I generally kept the rest of the ingredients very traditional for jambalaya. 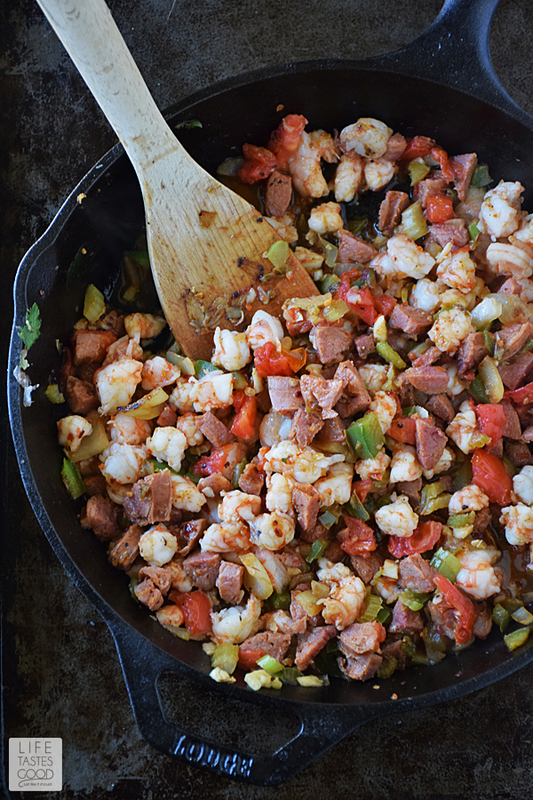 Keeping with the 'trinity of vegetables', Andouille Sausage and shrimp seasoned with creole seasoning for that authentic creole taste, my skillet dip tastes very much like traditional Jambalaya, albeit a little cheesier <smile>. 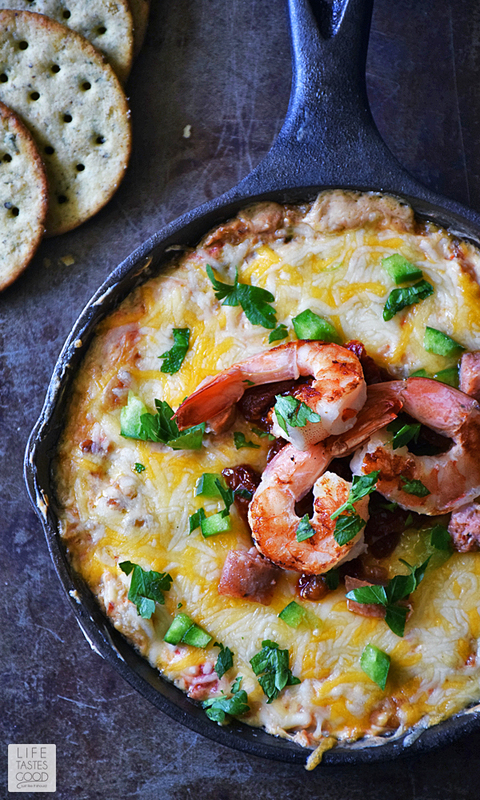 HOW DO YOU MAKE SKILLET JAMBALAYA DIP? Start by heating a tablespoon of olive oil over mid-high heat and saute 1/4 cup finely diced onion, 1/4 cup finely diced green pepper and 1/4 cup finely diced celery until the vegetables begin to soften, about 3 minutes. Give it a taste and adjust seasonings as needed. Add two 8 ounce packages of softened cream cheese and stir to melt the cheese and combine. Take another taste to make sure it is seasoned to your liking and top with 1 cup of shredded cheese. Place the skillet on the middle oven rack under the broiler for about 2-3 minutes until the cheese is melted to your liking. Remember when broiling to leave the oven door ajar and watch it closely. It will burn quickly! When cheese is melted as you like it, remove from oven and garnish with sliced sausage, chopped tomatoes, shrimp, and parsley if you like. Serve with crackers, chips or sliced baguette pieces and enjoy! 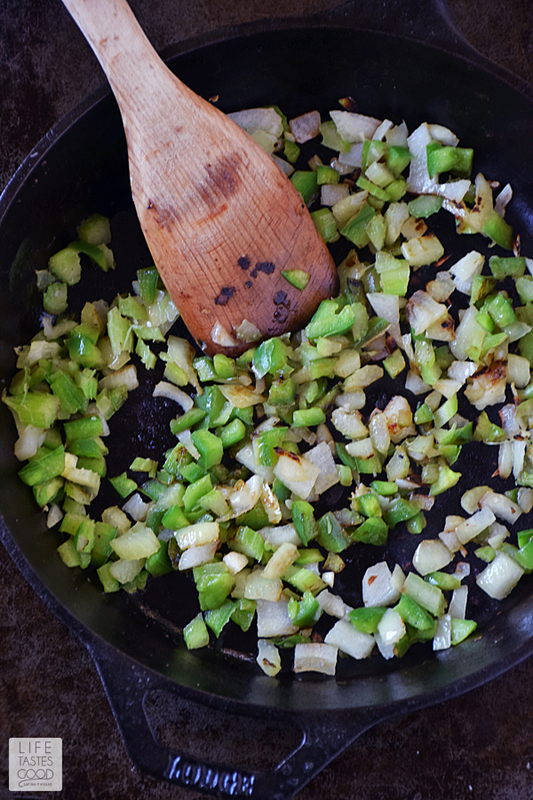 Heat a tablespoon of olive oil in a skillet over mid-high heat and saute 1/4 cup finely diced onion, 1/4 cup finely diced green pepper and 1/4 cup finely diced celery until the vegetables begin to soften, about 3 minutes. Add 1 tablespoon minced garlic, 1/2 cup freshly chopped tomatoes, 1 teaspoon Worcestershire Sauce, and 1/2 teaspoon hot sauce. Stir to combine. 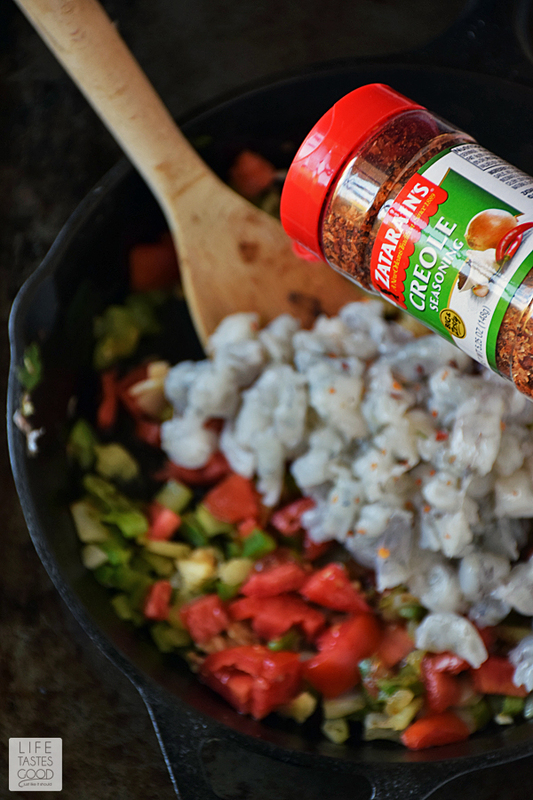 Toss in the shrimp and Andouille sausage and sprinkle on 1 tablespoon Zatarain's Creole Seasoning. Cook for about 3 minutes until shrimp is pink. When cheese is melted as you like it, remove from oven and garnish with sliced sausage, chopped tomatoes, shrimp, and parsley if you like. Serve with chips or sliced baguette pieces and enjoy! This recipe for Skillet Jambalaya Dip has been updated. 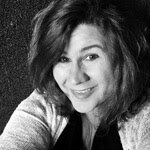 It first published on Life Tastes Good on 2/7/2016. Nutrient values are estimates only. Variations may occur due to product availability and food preparation. To obtain the most accurate representation of the nutritional information in a given recipe, you should calculate the nutritional information with the actual ingredients used in your recipe, using your preferred nutrition calculator. You are solely responsible for ensuring that any nutritional information provided is accurate, complete, and useful. Never mind the crackers, I just need a spoon for this, Marion. 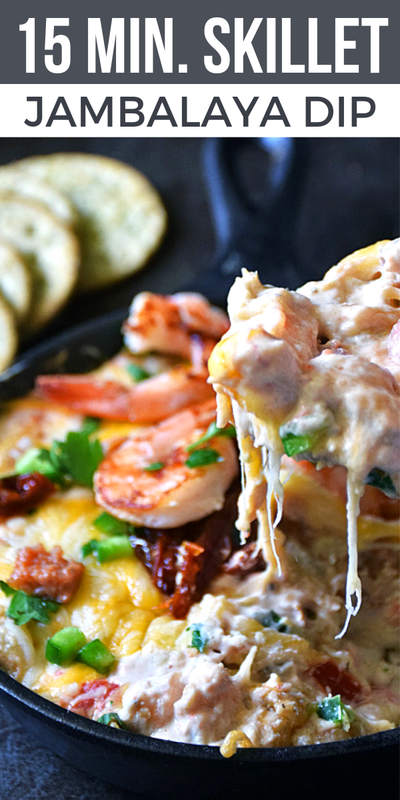 Your jambalaya dip is a fabulous idea! Oh yum. I want to have Mardi Gras at your house. I love this. 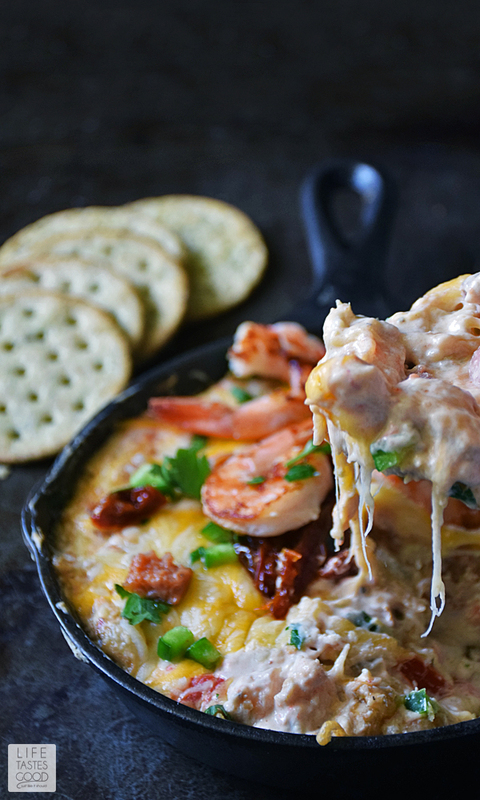 Cheesy, spicy shrimp dip??? Pass that pan MY way!!! This is mouthwatering! I would give anything to be digging into that dip right now. This is the best looking dip I have seen in a long time! I can't wait to try the recipe. This is a genius recipe and the photos are killing me. I so badly want to dip a cracker in and have a taste right now! I'm eagerly awaiting an occasion to make this and share it with friends. What a gorgeous dip! I can't wait to dig into it! If there are leftovers...how long in the fridge ? We had this the other night and it was SO good! The flavors were incredible and we will be having it again!